If you have uneven and spaced teeth, you may be prone to gum disease and other oral diseases. Having warped or uneven teeth is not only unattractive but also uncomfortable. So why not consider the services of a trusted La Grange orthodontist? Straightened teeth will not only give you confidence but also create beautiful and healthy smiles. Our answer for crooked and uneven teeth—Invisalign® clear braces. They are sometimes referred to as “adult braces” since most adults would rather not bother with those clinky metal-and-wire supports of yesteryear. With these essentially concealed braces you will not worry about the taste of metal and having to smile resembling “grandpa’s old Caddilac” while getting your uneven teeth straightened. Invisalign® clear braces are a secure and successful treatment for warped and misaligned teeth. We utilize high-tech 3D machine imaging innovation to arrange and customize every patient’s needs. This 3D imaging enables us to display a computerized view of your teeth before treatment and make a comparison to how your teeth will appear shortly after the treatment begins. After your initial check-up, our lab experts will create and customize your aligners. The clear aligners are created out of a medical-grade polymer (plastic), which is harmless yet incredibly durable. Your modified aligners are usually advised to be worn for 6 months to 2 years, depending on the severity of your case. During this period you will have your your aligners changed on a bi-weekly schedule. 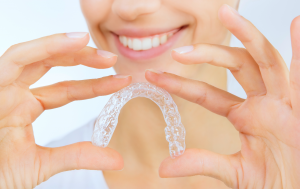 Invisalign® clear braces have been designed to reposition your teeth slowly but surely to have a comfortable and successful teeth straightening treatment throughout. You will notice that with each week that passes, your teeth are closer to the look you’ve always desired. With Invisalign® you avoid the uncomfortable feelings and soreness associated with conventional braces. You won’t ever need to change rubber bands as you do with conventional braces and there’s no worries about your favorite hard foods for fear of damaging your braces. I have been coming to Healthy Smiles for many years, with Dr. Danielson retiring I was disappointed, however after having a checkup and subsequent cavity fill with Dr. Qureshi any doubt has been put out of my mind. Extremely professional and personal as well! Great Dentist. Super friendly and genuinely cared for my well-being. Dr. Qureshi is an awesome dentist. Does a great job and seems to really care about his patients. What is Porcelain Dental Bridge? Gum Disease: How to Prevent?